The Legendary Defenders of Voltron newest season was released on Fri. Jan 20. In season one, the creators finished the season with a battle between Zarkon, the antagonist of the show, and all of the Paladins. The battle resulted in the Paladins being separated and put into unknown areas. As for the castle, Princess Allura, and Coran were put into a looped worm hole that seemed to transform the little mice and reverse the aging of Coran. This is only the beginning for season two… I WARN YOU! THERE ARE SPOILERS! Another example is how the Black Lion and Shiro really bonded. Shiro reached a deeper connection with his lion resulting in him gaining the lions bayard from Zarkon, the original Paladin of the Black Lion. Finally another big reveal was how Keith had unlocked the blade from the malmora and found out he is part Galra from his mom’s side. And finally, Pidge got confirmation that her brother and father are alive and being held captive by some space bandits. What I absolutely hated was not knowing what happened to Shiro. Why would the creators torture their fans that? The season was pretty thrilling and would’ve finished with a bang if Shiro would’ve stayed apart of it. I understand that the producers need to leave the viewers on the edge of their seats, but that was awful. It brought so much pain to me especially since Shiro is one of my favorite characters. Although the overall storyline was interesting, there were some “slow episodes.” I’m not saying that I want every episode to be an adrenaline rush, but there should at least be one “big” event in each episode. Hopefully it’s not like that next season. Overall, I was moved by another great season of Voltron, I really cannot wait for the next season to be released. The revealing of unforeseen cliffhangers and new characters are definitely something to keep me. 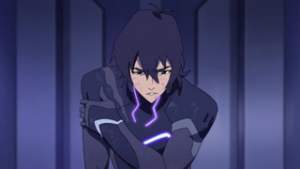 I’m interested in finding out how the creators introduce Prince Lotor, what happened to Shiro and Pidge’s family.